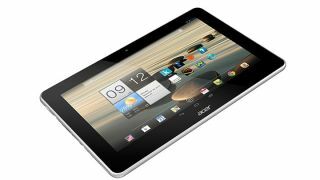 Completing Acer's pre-IFA product announcement deluge is the Iconia A3, a 10-inch Android Jelly Bean slate. It hasn't exactly set the TechRadar office aflame with passion, being as it is a pretty standard looking Android tablet with a quad-core 1.2GHz A7 processor, IPS display, Wi-Fi, 3G, Bluetooth 4.0 and so on and so forth. The biggest news is the tablet's price tag: the A3 will only set you back from €249, that's about £211 and basically makes it a 10-inch tablet for 7-inch money. Obviously, you'll pay more for 3G (€299 and up) and the 32GB version will cost more than the 16GB. There's no word of the tablet making its way over to the US but it will be coming to the UK, Europe, the Middle East and Africa in early October. What else has Acer announced for IFA 2013? An Android all-in-one and a 4K phone, that's what.